by Artful Danni on Flickr. Despite a serious slack of genuine summer weather and a worryingly late fruit harvest season, we are at the beginning of apple season. One of the best and brightest summer apple varieties is the Sunrise apple. For those not in the know, the Sunrise apple is a cross between the McIntosh apple and the Golden Delicious apple. It was developed in Summerland, BC[i]. Being an early harvest apple, it does not store as well as the later season apples, but it has a great crisp sweetness. A medium apple (approximately 154g) contains 80 calories, zero fat and sodium and 5g of dietary fibre[ii]. If you are doing a large harvest or making a large purchase, it is good to know that Sunrise apples make excellent applesauce. They also make a damn good apple tart. It sounds posh, it looks posh but if you don’t make the pastry dough yourself, it is a very simple treat to pull together. Remember, if you have a producing fruit tree in your yard, contact the Vancouver Fruit Tree Project to set up a harvest schedule that will help you help your community. Share the apple tart wealth. Roll the pastry dough slightly larger than 10×14 inches (or whatever size your baking sheet is). Using a ruler and a small knife, trim the edges. Place the dough on the prepared sheet pan and refrigerate while you prepare the apples. Peel the apples and cut them in half through the stem. Remove the stems and cores. Slice the apples crosswise in 1/4 inch thick slices. Place overlapping slice of apples diagonally down the middle the tart (the dough on your pan is the tart at this point) and continue making diagonal rows on both sides of the first row until the pastry is covered with apple slices. Sprinkle with the full half cup of sugar and dot with the small diced butter. Bake for 45 minutes to 1 hour, until the pastry is browned and the edges of the apples start to brown. Rotate the pan once during cooking. If the pastry puffs up in one area, cut a little slit with a knife to let the air out. The apple juices may burn in the pan but the tart will be fine. When the tart is done, heat the apricot jelly together with the rum and brush the apples and the pastry completely with the jelly mixture. Loosen the tart with a spatula so it doesn’t stick to the paper. Allow to cool and serve warm or at room temperature. You can find the recipe with dough making instructions at http://aisforaubrie.blogspot.com/2010/08/contessa.html . 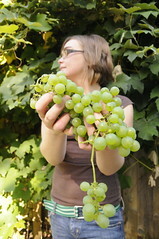 ~ Aubrie is a blogger with the Vancouver Fruit Tree Project. [iii] Adapted from “French Apple Tart”. Barefoot Contessa Back to Basics: Fabulous Flavour from Simple Ingredients by Ina Garten, New York: Clarkson Potter/Publishers, 2008. It took me quite a while to really get into figs. I have zero claim to any sort of Asian, Middle Eastern or Mediterranean heritage and I didn’t even realise my mother had a fig tree until she mentioned she was having it removed from the yard. I suppose I always assumed figs were an acquired taste, an ‘adult’ taste. It turns out, I’m a nut and figs are delicious. The tricky thing about figs is that they are very delicate and do not travel well. Luckily, the Lower Mainland has a climate that supports the fruit so it doesn’t have to go far to get to your table. And if you don’t appreciate the figs growing in your yard, let the Vancouver Fruit Tree Project harvest them and share them within the community. A large, raw fig (approximately 64g) has a mere 47 calories and is packed with calcium and fibre[i]. Welcome Aubrie Chaylt, new blogger for the VFTP! This month, Aubrie brings us a look at cherries. When I was seventeen years old, my father lived in a house with a massive cherry tree in the front yard. My younger brother and I would scale the tree with buckets in hand to harvest the sweet summer fruit. Even if it doesn’t feel quite like summer yet, summer fruit is in our immediate future. I’m excited for cherries! And you should be too. The Vancouver Tree Fruit Project pickers will be rescuing a sweet and juicy fruit crop otherwise doomed to rot on the ground and redistributing it where there is need in the Vancouver community. Cherries are a low calorie treat with 87 calories per 1 cup with pits and they are a source of dietary fibre as well as vitamin C[i]. Stem, sort and wash your cherries. The more the merrier, more cherries = more cherry juice. I used 6 cups. Drain and pit the little suckers. Crush them, really crush them with a potato masher or the back of a wooden spoon. Heat them to 165°F without boiling. Strain the juice. Cool overnight and strain again. To sweeten, add sugar. To add tartness, add lemon juice. 1 cup homemade cherry juice! Preheat oven to 250°F. Mix flour, salt, and pepper on a large plate. Lightly coat your lamb chops with the flour mixture and shake off any excess. Melt butter with oil in a large skillet over medium-high heat. Add lamb chops and cook to desired doneness, about 3 minutes per side for medium-rare. Transfer the chops to a baking sheet and keep warm in oven while preparing sauce (do not clean skillet). Add your onion to the same skillet and sauté for about 2 minutes. Add your cherry juice and bring to a boil, scraping up any browned bits. Boil until the liquid is slightly reduced and the onion is slightly softened, stirring frequently, about 4 minutes. Stir in cherries and half of the basil and cook 1 minute. Season the sauce you’ve just created (you areso amazing) to taste with salt and pepper. Place 2 lamb chops on each of 4 plates and spoon sauce over. Sprinkle remaining basil over and serve. [ii] Recipe adapted from The Encyclopedia of Country Living by Carla Emery. 10th ed. Seattle: Sasquatch Books, 2008.